Astrophysicists use a catalog of extended gamma-ray sources spotted by Fermi spacecraft to home in on mysterious properties of deep space. When astrophysicists look at the gamma-ray glow from a galaxy outside our own, all they typically see is a small spot because the galaxy is extremely far away. So, when a galaxy appears as an extended blob, something extraordinary must be going on that could help researchers better understand the properties of deep space. Now, scientists, including researchers from the Department of Energy’s SLAC National Accelerator Laboratory, have compiled the most detailed catalog of such blobs using eight years of data collected with the Large Area Telescope (LAT) on NASA’s Fermi Gamma-Ray Space Telescope. The blobs, including 19 gamma-ray sources that weren’t known to be extended before, provide crucial information on how stars are born, how they die, and how galaxies spew out matter trillions of miles into space. Intriguingly, though, it was the cosmic regions where they didn’t find blobs that shed new light on two particularly mysterious ingredients of the universe: dark matter – an invisible form of matter six times more prevalent than regular matter – and the magnetic field that pervades the space between galaxies and whose origin is unknown. “These data are very exciting because they allow us to study some of the most fundamental processes in the universe, and they could potentially lead us to discover completely new physics,” says NASA scientist Regina Caputo, one of the leaders of the recent study by the international Fermi-LAT collaboration, which was published in The Astrophysical Journal. One of the things the researchers looked for were gamma-ray blobs associated with companion galaxies orbiting our Milky Way. Since the faintest of these satellites contain very few stars, they are thought to be held together by dark matter. Scientists believe dark matter could be made of particles called WIMPs, which would emit gamma rays when they collide and destroy each other. A gamma-ray blob signal coming from an ultrafaint satellite galaxy would be a strong hint that WIMPS exist. In the new study, the Fermi-LAT researchers searched for gamma-ray blobs associated with those predicted satellite galaxies. They didn’t find any. But even the fact that they came up empty-handed is an important result: It will allow them, in future studies, to define the distribution of dark matter in Milky Way satellites and the likelihood that WIMPs produce gamma rays. It also provides new input for models of galaxy evolution. The researchers also used their data to obtain more information on the strength of the magnetic field between galaxies, which they hope will be an important puzzle piece in determining the origin of the field. For this part of the study, the team looked at blazars – active galaxies that spit high-speed jets of plasma far into space. 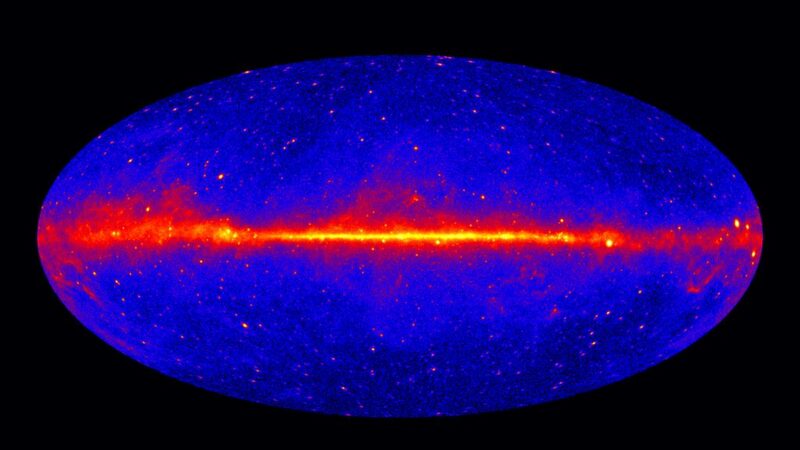 The Fermi spacecraft can detect gamma rays associated with jets that point in the direction of the Earth. 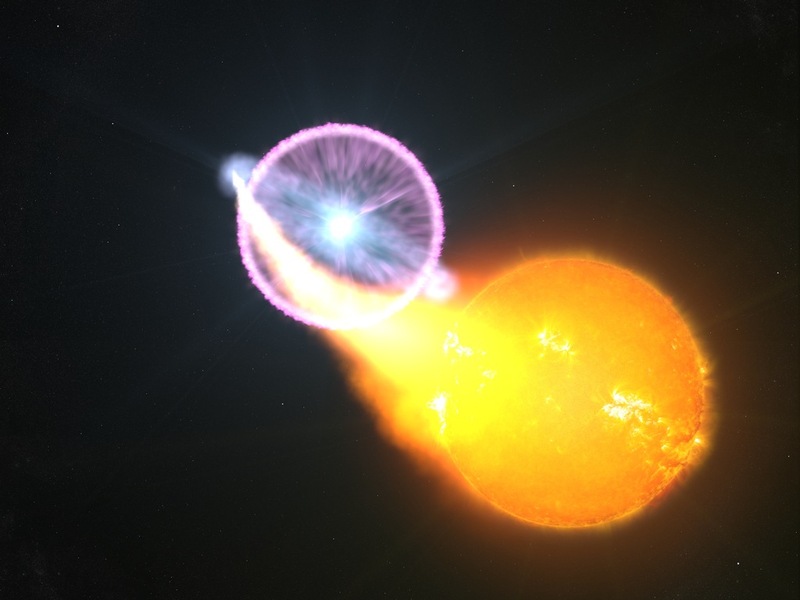 Blazars appear as point-like sources, but a mechanism involving the intergalactic magnetic field could potentially make them look like extended sources, says Manuel Meyer, a Humboldt fellow at the Kavli Institute for Particle Astrophysics and Cosmology (KIPAC) and another lead author of the study. The researchers didn’t find any blobs associated with blazars. Again, this no-show was valuable information: It allowed the team to calculate that the magnetic field is at least a tenth of a millionth billionth as strong as Earth’s magnetic field. The magnetic field’s upper limit – a billion times weaker than Earth’s field – was already known. The intergalactic field is stronger than the researchers had expected, Meyer says, and this new information might help them find out whether it stems from material spilled into space in recent times or whether it was created in processes that occurred in earlier cosmic history. NASA’s Fermi Gamma-ray Space Telescope is an astrophysics and particle physics partnership, developed in collaboration with the U.S. Department of Energy Office of Science and with important contributions from academic institutions and partners in France, Germany, Italy, Japan, Sweden and the United States. The Fermi mission recently celebrated its 10th anniversary. A number of SLAC researchers are members of the international Fermi-LAT collaboration. SLAC assembled the LAT and hosts the operations center that processes LAT data. The new analysis benefitted from a data analysis package, initially developed by KIPAC researcher Matthew Wood, that automates common analysis tasks. KIPAC is a joint institute of SLAC and Stanford University. A science team in Antarctica is preparing to loft a balloon-borne instrument to collect information on cosmic rays, high-energy particles from beyond the solar system that enter Earth’s atmosphere every moment of every day. The instrument, called the Super Trans-Iron Galactic Element Recorder (SuperTIGER), is designed to study rare heavy nuclei, which hold clues about where and how cosmic rays attain speeds up to nearly the speed of light. The launch is expected by Dec. 10, weather permitting. Explore this infographic [on the full article] to learn more about SuperTIGER, cosmic rays and scientific ballooning. The most common cosmic ray particles are protons or hydrogen nuclei, making up roughly 90 percent, followed by helium nuclei (8 percent) and electrons (1 percent). The remainder contains the nuclei of other elements, with dwindling numbers of heavy nuclei as their mass rises. With SuperTIGER, researchers are looking for the rarest of the rare — so-called ultra-heavy cosmic ray nuclei beyond iron, from cobalt to barium. When a cosmic ray strikes the nucleus of a molecule of atmospheric gas, both explode in a shower of subatomic shrapnel that triggers a cascade of particle collisions. Some of these secondary particles reach detectors on the ground, providing information scientists can use to infer the properties of the original cosmic ray. But they also produce an interfering background that is greatly reduced by flying instruments on scientific balloons, which reach altitudes of nearly 130,000 feet (40,000 meters) and float above 99.5 percent of the atmosphere. The most massive stars forge elements up to iron in their cores and then explode as supernovas, dispersing the material into space. The explosions also create conditions that result in a brief, intense flood of subatomic particles called neutrons. Many of these neutrons can “stick” to iron nuclei. Some of them subsequently decay into protons, producing new elements heavier than iron. Supernova blast waves provide the boost that turns these particles into high-energy cosmic rays. 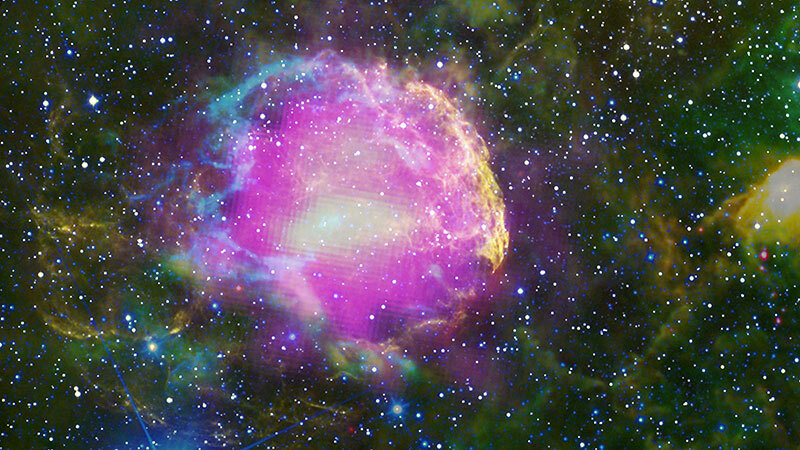 NASA’s Fermi Proves Supernova Remnants Produce Cosmic Rays. February 14, 2013. As a shock wave expands into space, it entraps and accelerates particles until they reach energies so extreme they can no longer be contained. On Dec. 1, SuperTIGER was brought onto the deck of Payload Building 2 at McMurdo Station, Antarctica, to test communications in preparation for its second flight. Mount Erebus, the southernmost active volcano on Earth, appears in the background. Over the past two decades, evidence accumulated from detectors on NASA’s Advanced Composition Explorer satellite and SuperTIGER’s predecessor, the balloon-borne TIGER instrument, has allowed scientists to work out a general picture of cosmic ray sources. Roughly 20 percent of cosmic rays were thought to arise from massive stars and supernova debris, while 80 percent came from interstellar dust and gas with chemical quantities similar to what’s found in the solar system. 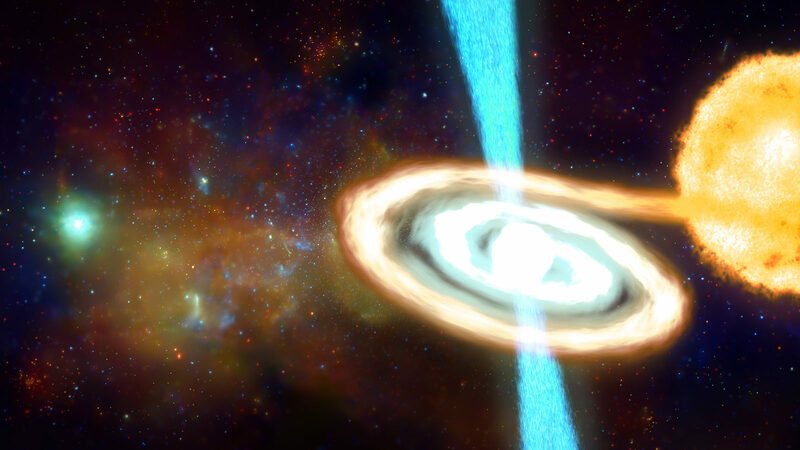 “Within the last few years, it has become apparent that some or all of the very neutron-rich elements heavier than iron may be produced by neutron star mergers instead of supernovas,” said co-investigator Jason Link at Goddard. Neutron stars are the densest objects scientists can study directly, the crushed cores of massive stars that exploded as supernovas. Neutron stars orbiting each other in binary systems emit gravitational waves, which are ripples in space-time predicted by Einstein’s general theory of relativity. These waves remove orbital energy, causing the stars to draw ever closer until they eventually crash together and merge. Theorists calculated that these events would be so thick with neutrons they could be responsible for most of the very neutron-rich cosmic rays heavier than nickel. On Aug. 17, NASA’s Fermi Gamma-ray Space Telescope and the National Science Foundation’s Laser Interferometer Gravitational-wave Observatory detected the first light and gravitational waves from crashing neutron stars. Later observations by the Hubble and Spitzer space telescopes indicate that large amounts of heavy elements were formed in the event. SuperTIGER is funded by the NASA Headquarters Science Mission Directorate Astrophysics Division. The National Science Foundation (NSF) Office of Polar Programs manages the U.S. Antarctic Program and provides logistic support for all U.S. scientific operations in Antarctica. NSF’s Antarctic support contractor supports the launch and recovery operations for NASA’s Balloon Program in Antarctica. Mission data were downloaded using NASA’s Tracking and Data Relay Satellite System. They have turned their attention to one classical nova in particular, ASASSN-16ma, located within the “archer” constellation Sagittarius. 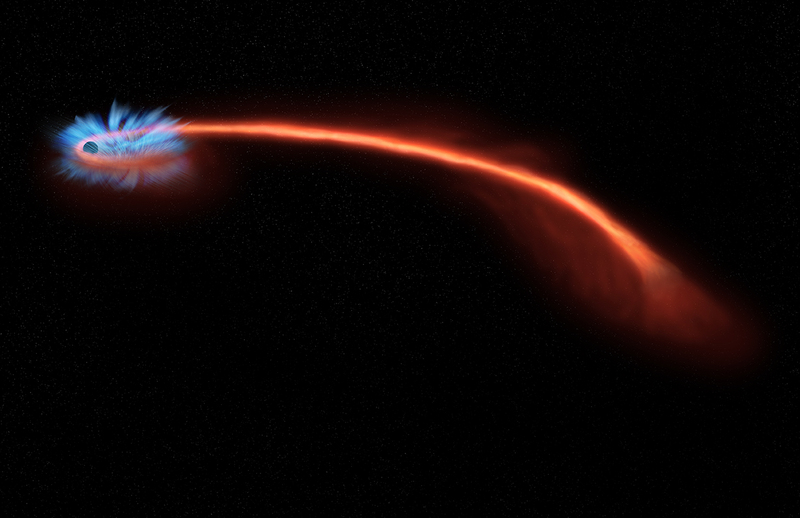 Their paper, recently published in Nature Astronomy, suggests a novel source for the nova’s post-outburst glow — offering insight into other outer-space explosions. Blueshift is produced by a team of contributors in the Astrophysics Science Division at Goddard. Started in 2007, Blueshift came from our desire to make the fascinating stuff going on here every day accessible to the outside world. LIGO is not alone in latching onto the promise of multi-messenger astronomy. The Supernova Early Warning System (SNEWS) also unites multiple experiments to look at the same event in different ways. Neutral, rarely interacting particles called neutrinos escape more quickly from collapsing stars than optical light, so a network of neutrino experiments is prepared to alert optical observatories as soon as they get the first warning of a nearby supernova in the form of a burst of neutrinos. The Fermi Large Area Telescope orbits the earth as the primary instrument on the Fermi Gamma-ray Space Telescope. 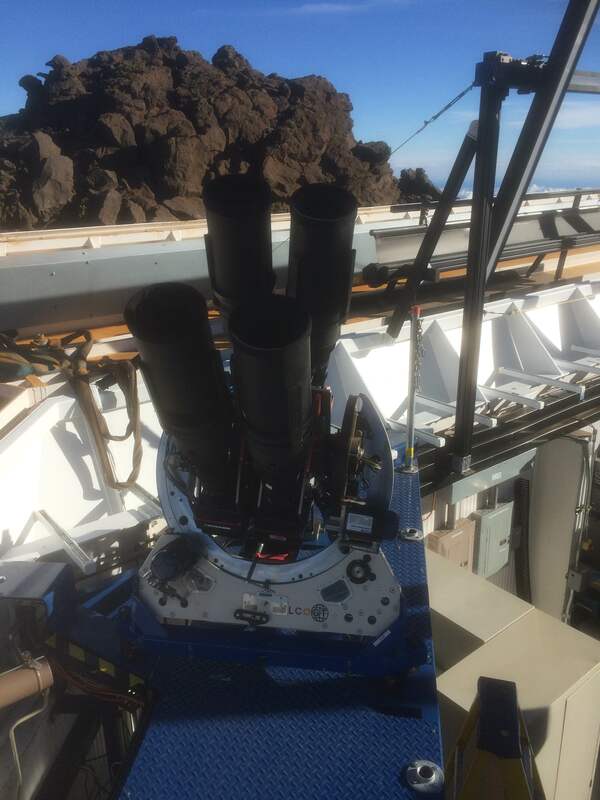 The telescope is constantly in motion and has a large field of view that surveys the entire sky multiple times per day.